Orientation is the ability to know where you are in space in relation to people, objects and your destination. Mobility is ability to move through that space from point A to point B safely and efficiently. Itinerate O & M consists of a Certified O & M instructor going to the client and either working with them in their areas of travel or meeting them in unfamiliar areas to practice applying the skills they have learned. Adult O & M is one-on-one, individualized training. Each client receives an assessment and an Individualized Service Plan that focuses on the exact needs of the client. The client is measured for a cane to use for obstacle and drop off detection and a personalized cane tip for surface preview. The client is also offered a glare assessment for both indoor and outdoor glare shields to help reduce the pain of glare from the sun or indoor lights. O & M training encompasses a wide range of skills that include but are not limited to: protective techniques, human guide, cane orientation, cane technique and arch, shore lining, numbering and address systems, cardinal directions, route planning, mental mapping, landmarks, stair techniques, drop off detection, street crossings (lighted, stop sign and uncontrolled), analyzing intersections, mall travel, bus travel, train travel, soliciting assistance, etc. While there are a finite number of skills, there are infinite ways for the client to apply them in any kind of environment. O & M training depends on the goals and needs of the client. Other factors that help the O & M determined the Individualized Service Plan for the client are stamina, health and balance as well as any other disabilities. O & M empowers an individual by helping them to gain or regain their independence and confidence in themselves. The world opens up to them through the use of proper O & M tools and techniques, which provides a sense of determination to walk out their front door and continue to live their life to the fullest. 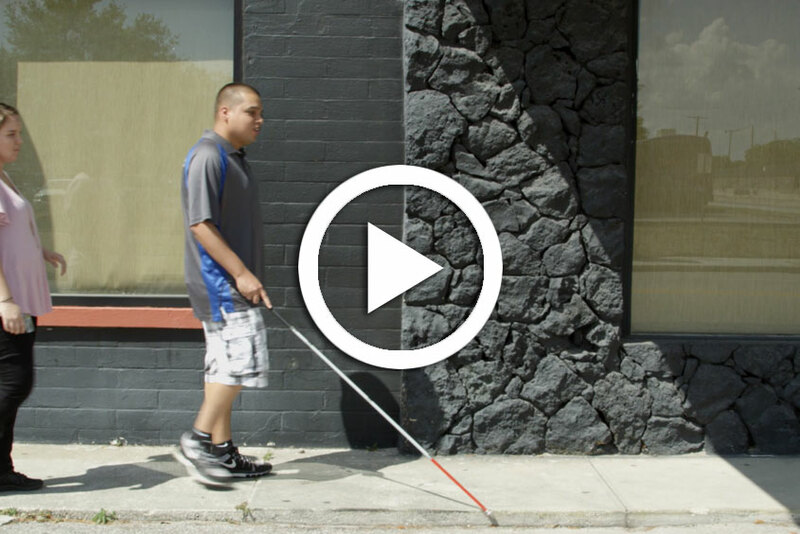 For someone living with blindness, the ability to orient themselves to a space and navigate that space safely, is of paramount importance to maintaining a life of independence. O & M opens the world to individuals living with vision loss through the use of proper tools and techniques, which provides them with a sense of determination to walk out their front door and continue to live their life to the fullest. Adult O & M is one-on-one, individualized training. Each client receives an assessment and an Individualized Service Plan that focuses on the exact needs of the client.